In 1989, a computer database was created to store the information collected since the early 1970s by the Heritage Survey Program. Data entry has been ongoing ever since. Over the years, technology has advanced, and the Heritage Survey database software has been updated a number of times. Among the most exciting developments is the ability to store and retrieve images. There are several hundred thousand photographs in the Heritage Survey collection waiting to be uploaded, so it will take a while to catch up! Watch this blog to learn about some of these images as they’re added. Scans from this 1971 roll were recently uploaded. Check out the photos of five important buildings on the University of Alberta campus in Edmonton: the Arts Building (HS 53226), Rutherford House, the South Laboratory (HS 9445), the Power Plant, and Old St. Stephen’s College. College is a Provincial Historic Resource, and the home of the Heritage Survey Program. Click the above links to view images on the Heritage Resources Management Information System (HeRMIS) website. In the aftermath of World War I, the Dominion government established the Soldiers Settlement Board, which was to serve two purposes. First, it was a mechanism whereby the government could reward men who had physically defended their country in time of need; second, it could provide an outlet for an unemployment problem that was rapidly building up. The Board identified tracts of land in arable districts which had not hitherto been taken up by homesteaders and proceeded to have portions of them set aside for the soldiers. One region where considerable land was reserved was the Peace River Country, the central grasslands of which had been settled much earlier. One of the districts of this region where soldiers were encouraged to come was a small stretch of parkland off the Bad Heart River, which flows through the Burnt Hills into the Smoky River. Here, in TPs74 & 75 R2 W6, several veterans took advantage of the government’s offer and applied for land in 1919, including the highly decorated but soon to be notorious George Frederick “Nobby” Clark. The war veterans were soon joined by other settlers, and, gradually, the community to be known as Bad Heart evolved. A school district was incorporated in 1928 and a store and post office was built the following year. Bad Heart was, however, somewhat cut off from the more heavily settled areas of the Grande Prairie, and conditions were far from ideal for farming. A number of foreclosures occurred, but the community did hang together, as cattle, hogs and poultry were raised to offset the costs of dry land farming. Being remote however, amenities were few, and it wasn’t until the late 1950’s that electrical power and telephone services were extended there. Until the mid-1950’s, the Bad Heart district was without a church, with local residents attending Roman Catholic, Anglican and United Churches in the Teepee Creek district just to the southwest. At the time, one of the most energetic Roman Catholic priests in the region was resident at Sexsmith, over 50km away. This was the Redemptorist Father Francis Dales, who, as a trained architect, had just designed a new $70,000 church in Sexsmith. He had also constructed, and would design and construct other public buildings, the work being either volunteer or undertaken by young teenagers at a small wage. To complete his projects, Father Dales often salvaged lumber from demolished buildings. Scrap metal from demolished vehicles and farm equipment was also recovered and sold. Other fundraisers of varying kinds were also undertaken. As his parish included Bad Heart, Father Dales decided, in the early 1950’s, that it was time for a church of the right persuasion to be built there. For the district at this time, the major problem was financing, for all Roman Catholic churches relied strongly on local support, and the people of Bad Heart were hardly in a position to fund a new church structure, being relatively few in numbers and anything but wealthy. Work bees and salvaged lumber would not be enough. 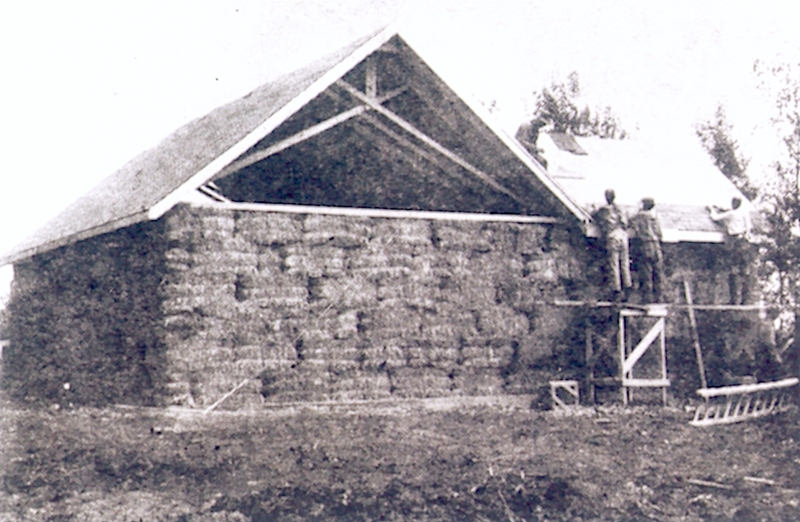 Father Dales, however, had learned that, in eastern Canada, certain farmers had built cattle sheds out of straw bales, the oil from the rye or flax serving as a preservative. He therefore submitted a design to the Vicar Apostolic of the Archdiocese of Grouard, Bishop Henri Routhier, who approved the plan, and, apparently, personally advanced $500 towards its fulfillment. 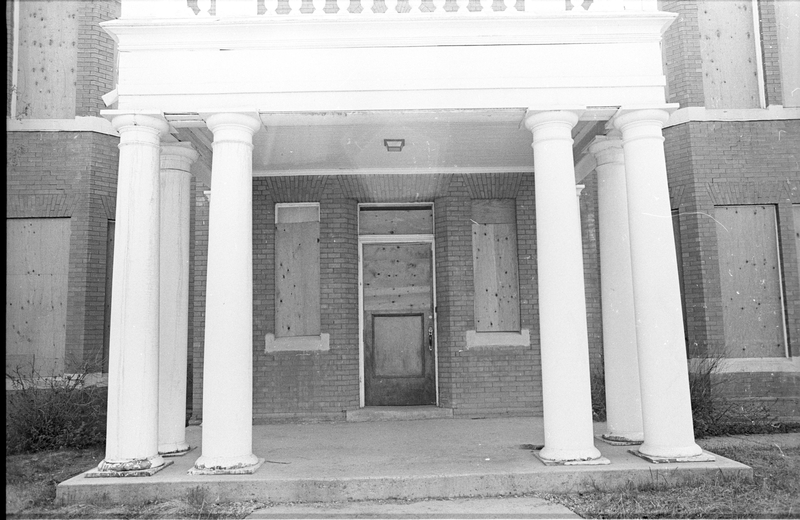 In the summer of 1954, work began on the soon to be famous rye straw church at Bad Heart. Before long, word spread of the unique venture, which was completed in about six weeks. Eventually, even the Toronto Star Weekly did a story on the church and its builder. All work, of course, was volunteer, while fixtures and furnishings were salvaged from other churches in the region. 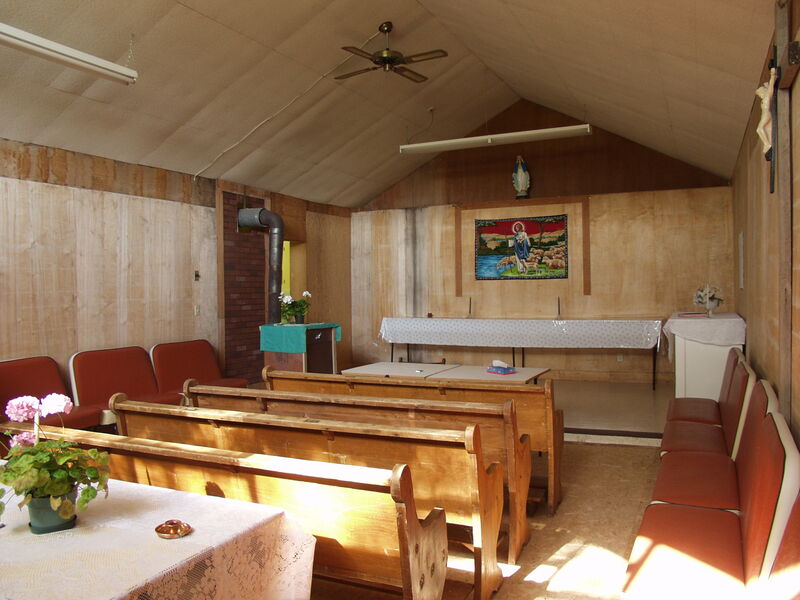 The pews, for example, were taken from the old Roman Catholic church in Sexsmith. In March 2009, the Bad Heart Straw Church was designated a Provincial Historic Resource. Its significance lies foremost in its representation of the ability of people in remote rural areas of the province to find ways of adapting what they have into useful purposes. 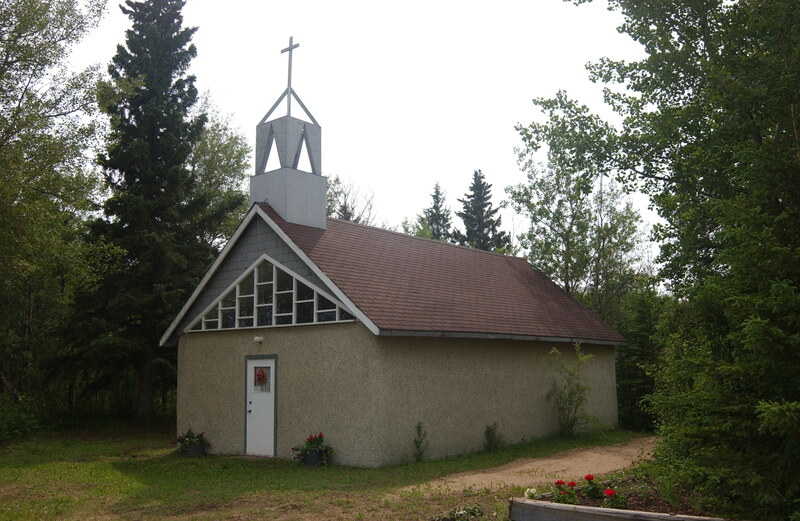 The building is also important in being directly associated with Father Francis Dales, the ebullient architecture priest who designed and built many structures in the region and elsewhere, including several churches, St. Mary’s Roman Catholic School in Sexsmith, and the Anglican Speke Hall in Grande Prairie. Visit the Alberta Register of Historic Places to learn more about the heritage value of the Bad Heart Straw Church. In order for a site to be designated a Provincial Historic Resource, it must possess province-wide significance. To properly assess the historic importance of a resource, a historian crafts a context document that situates a resource within its time and place and compares it to similar resources in other parts of the province. This allows staff to determine the importance of a resource to a particular theme, time, and place. Above, is some of the historical information used in the evaluation of the Bad Heart Straw Church. Four New Projects Approved for MHPP Funding! The Alberta Historical Resources Foundation, at its October meeting in Medicine Hat, approved grants for four communities to engage in heritage planning projects with the support of the Municipal Heritage Partnership Program (MHPP). The City of St. Albert was approved for $20, 000 to undertake a heritage management plan. This builds upon the solid foundation laid by St. Albert with its Heritage Inventory project, completed a few years ago. Strathcona County, following up from its Heritage Management plan, is now planning to identify its potentially significant historic places. The County was approved for an MHPP grant of $30, 000 to carry out this project. 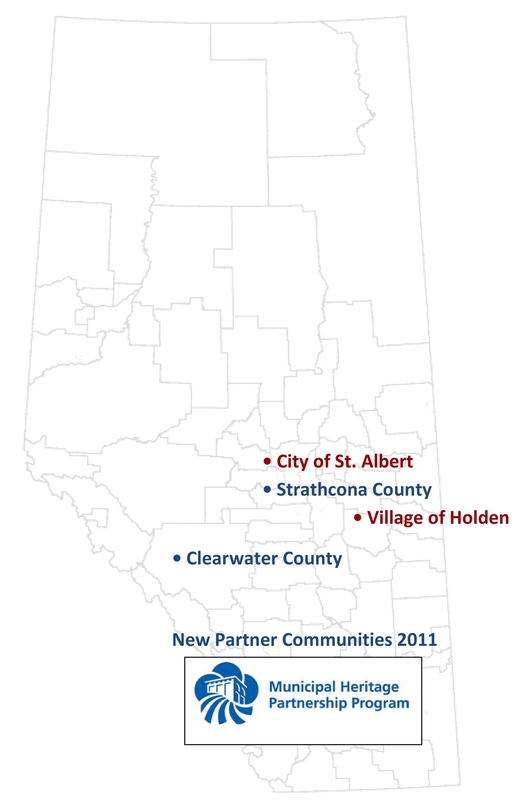 Clearwater County, a new partner with MHPP, is undertaking a Heritage Inventory project to evaluate five places of interest in the Nordegg Townsite, and five additional resources in rural areas. Clearwater County was approved for an MHPP grant of $12, 500 for this work. The Village of Holden, which, as a small community, has successfully completed a Heritage Survey and Inventory with the help of MHPP is now looking to create solid heritage policy and a management plan. MHPP is supporting the Village with a grant of $7, 500. A few days ago we introduced our newest colleague, Carlo Laforge. Doing so, our editor realized that many regular contributors to RETROactive were never introduced to our readers. So, without further ado, allow me to introduce … myself. 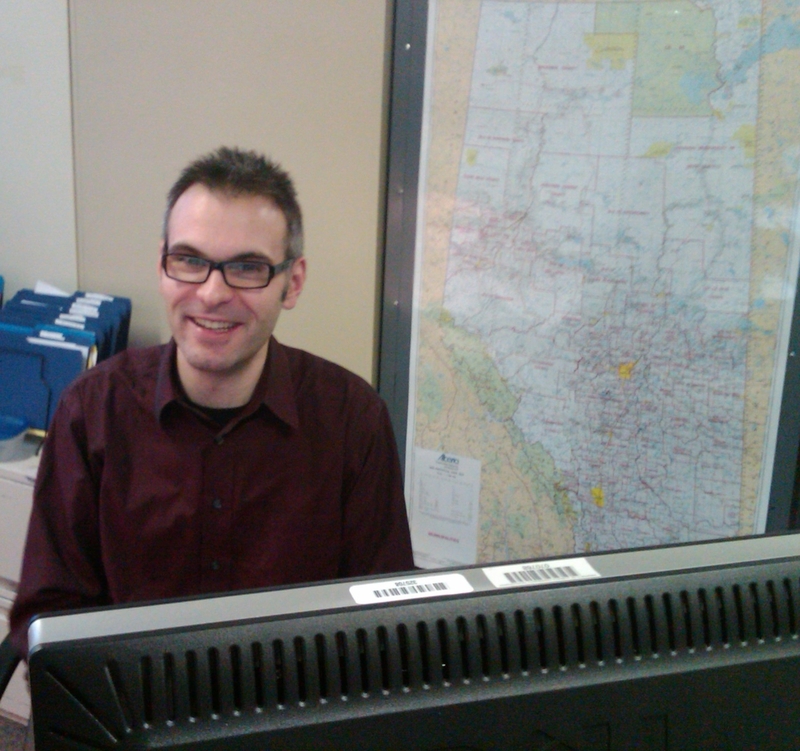 I started working for the Government of Alberta’s Historic Resources Management Branch in the spring of 2008. I was assigned to the Municipal Heritage Partnership Program and have been busily helping Alberta’s municipalities identify, protect and conserve locally significant historic resources. My work has given me the privilege of traveling all over Alberta to visit municipalities large and small, urban and rural. I’ve talked with municipal councils, facilitated workshops for council-appointed Heritage Advisory Bodies and discussed Municipal Historic Resources designation with municipal staff and property owners. Back at the office, I have managed the Municipal Heritage Partnership Program’s grant agreements with municipalities. I am also responsible for processing nominations to list Municipal Historic Resources on the Alberta Register of Historic Places. I also prepare training material for municipal staffers on how to evaluate and protect historic resources (like the Managing Historic Places Designation Guide). Before returning home to Alberta, I worked at the Government of Saskatchewan’s Heritage Conservation Branch for four years. I conducted historical research in support of the Provincial Heritage Property designation program. I also wrote several Statements of Significance for Municipal Heritage Properties listed on the Saskatchewan Register of Heritage Property and the Canadian Register of Historic Places. I hold a Bachelor of Arts degree with a combined major of English and History from the University of Calgary and a Master of Arts degree (history) from the University of Saskatchewan. In my spare time … I have hobbies. If I haven’t met you in person yet, I look forward to doing so. Property owners occasionally ask whether historic wood windows and trim can be clad in sheet metal to both eliminate maintenance and protect fragile historic material. As conservation advisers, we discourage cladding since it removes, in effect, a character-defining element from the building, and cladding raises maintenance issues of its own. Tempting though it may be, simply covering up deteriorated areas can ignore the causes of deterioration, leaving underlying moisture or other problems to continue their destructive work within the structure. 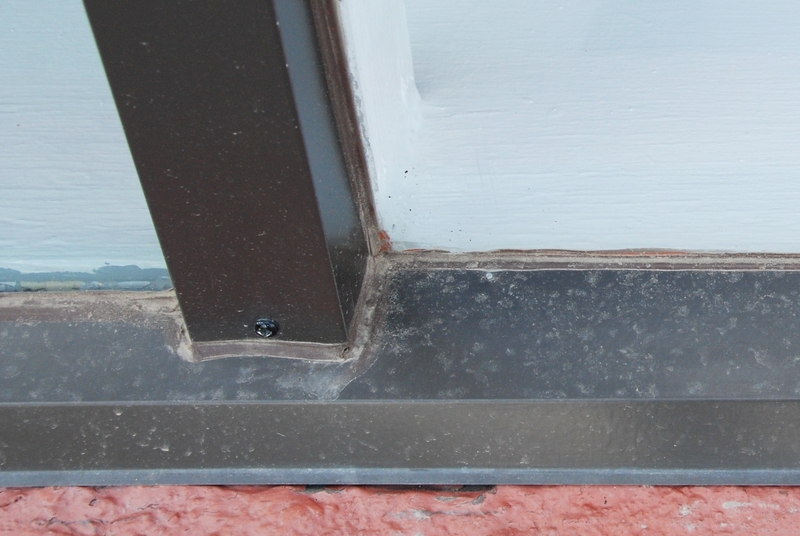 Wood sills, as an example, may be weathered rather than actually rotted and can often be treated relatively easily and economically with wood epoxy repairs. Once repaired, the repainted wood is stable, rot-resistant and easily maintained. This isn’t to say cladding is always inappropriate: it may be a valid means of adding a weather detail missing in the historic element while minimizing impacts on heritage value. In general, though, it’s preferable to have an authentic original material that you can appreciate and easily maintain. Written by: Fraser Shaw, Heritage Conservation Adviser. A previous RETROactive blog post featured the recent designation of the Lacombe Blacksmith Shop as a Provincial Historic Resource. Do you want to do more than simply read about the Blacksmith Shop? Click here to watch some of the designation ceremony AND to watch the two blacksmiths practice their craft. Enjoy! 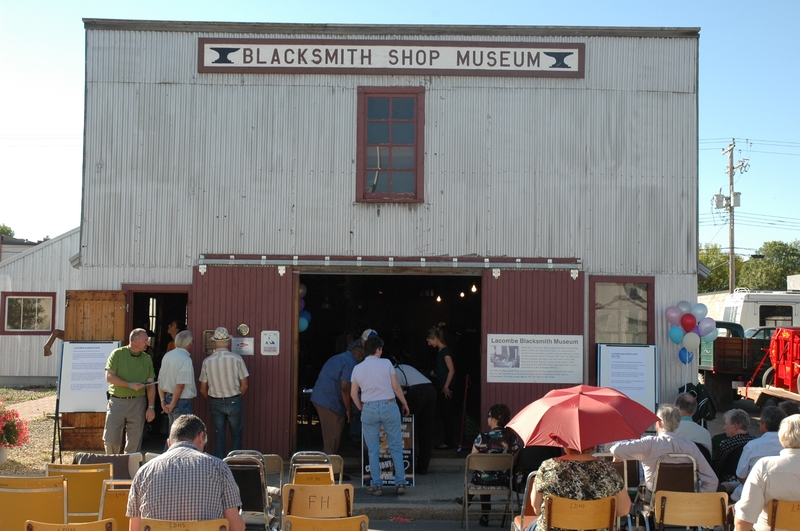 Check out the Lacombe & District Historical Society blog to learn more about visiting the Blacksmith Shop Museum.